Keeping with the Florida theme, here's another great underwater scene, this time from Marine Studios, Marineland, Florida. As that my postcard has no message or postmark on the reverse, I can't be sure of it's age. However, after some quick research, I have found another postcard in this series here — this postcard, M-11, is also in my collection; M-7 and M-11 being the only two cards I have of this series. According to this resource, this series of postcards was first printed in 1946. The reverse side of the card contains this text: Three Fathoms Down! This spotted porpoise is about to steal the "Birdie" (mullet) from the hand of the diver as the call "Action, Camera!" sounds and motion picture men shoot this scene through one of the portholes at Marine Studios, Marineland, Florida. Marine Studio is located 18 miles south of St. Augustine on the new Ocean Shore Boulevard (Florida A1A), one of the Holiday Highways. Duval News Company, Jacksonville, Fla. 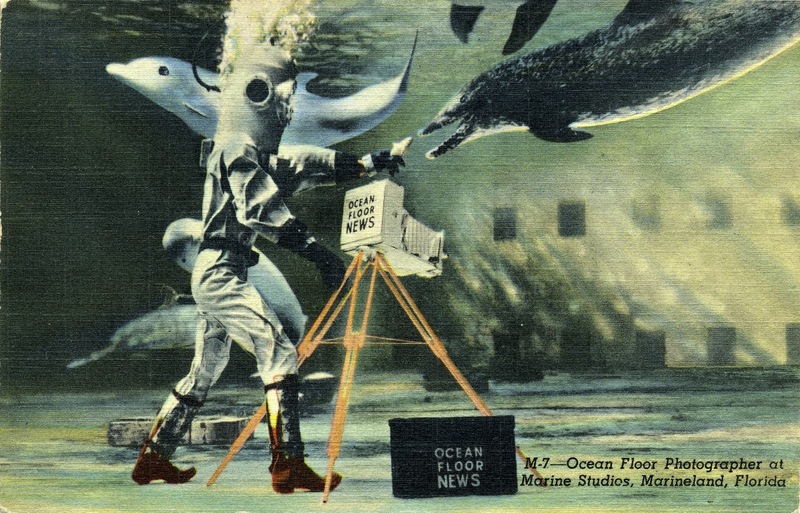 The Marine Studios, later to adopt the name Marineland, began operations in 1938. It's construction was bourne with the idea of creating an underwater studio where marine life could be sustained and filmed. The park is still in operation today. For more information on Marineland, go here.